One of the most popular Tuscan desserts is the delicious cantucci biscuit, or to use its Italian name: Cantucci di Prato. They originate from Prato, which is the second largest city in Tuscany, and is home to many culinary specialities. So, what makes these biscuits so special, and more importantly, how do you make them? 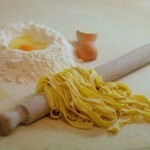 Get hands on with hand made pasta! 62 queries in 1.370 seconds.